Yes, it's just another lazy "Top Ten" post, but to be even lazier, I'm not even going to say anything about these films other than post their synopses from the IMDb. I do, of course, reserve the right to come back and add a mini-review of each film later, but all you need to know is that they are great. 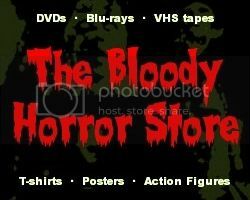 You can now throw away every other horror movie and thriller you own because these are the best of the best! No, not really, but I really do wish that it was that simple. Spain has started to become the new Canada in the way that its filmmakers borrow plots from several existing movies and mix them together, but they do it very well indeed. The cinematography in every case is exactly what real films should look like, and the actresses are the hottest in the world. If only the stories weren't so clichéd, and the movies were a little bit more brutal instead of so cerebral, Spain would rule the horror industry. It's only $5 in Wal-mart, so you've all got this now. "Alejandro is an elderly writer, and is driving back to the small costal village where he was born and raised. But the peaceful place of his memories has been turned into a vast tourist resort, full of brazen consumerism with no charm left at all." The best of the "Films to Keep You Awake" (aka "Películas para no dormir") series. It's like "The Reflecting Skin" (1990), but Natalia Millán is far sexier than Lindsay Duncan. I haven't written a full review of this yet. "Daniel and Laura, both teachers, are confronted by an unusual situation when Mario, a childhood friend of Daniel's, turns up acting strangely and wanting them to meet his daughter, Julia." It's only "Demons 2" (1986) with shakycams, and I actually prefer "Quarantine" (the remake) in some ways, but... this has a more supernatural ending. A thriller/drama with horror elements... and Marta Etura, OMG! "While doing a thesis about violence, Ángela finds a snuff video where a girl is tortured until death. Soon she discovers that the girl was a former student in her faculty." Directed by Alejandro Amenábar. Starring Ana Torrent, Fele Martínez, and Eduardo Noriega! What more do you need to know? "The story of a woman who is slowly losing her sight whilst trying to investigate the mysterious death of her twin sister." I haven't written a review of this either because it's more of a thriller than a horror. But Belén Rueda again, oh yes! "After Carlos, a 12-year-old whose father has died in the Spanish Civil War, arrives at an ominous boy's orphanage he discovers the school is haunted and has many dark secrets that he must uncover." You don't even need me to review this, do you? Maybe I will one day. "Three hooded Eastern-European criminals burst into a home in a Madrid gated community, holding the family hostage in its own home, and forcing the father to empty his credit cards." It's a home invasion movie which makes "You're Next" look even less original. I thought I'd already reviewed it, but apparently not. This is how the Horror Lamers do it and get hundreds of comments, right?